Professor Ian Lean, of the school of Veterinary Science at Sydney University, and spokesman for the 35 scientists who support hormone fed livestock, responds here to criticism from Voiceless animal rights chairman Brian Sherman that he and his colleagues are funded by drug companies and thus biased. Mr Sherman’s letter follows Professor Lean’s comments. Who is right? POST YOUR VIEWS! ii) The goal is to constantly improve the environment and well-being of animals – my comments in regard to pig confinement were made in the context of how did confinement systems arise – It was to protect piglets from deathand injury. Recent very good research at the University of Sydney has been directed to improving the safety and environment for pigs. The pig industryis adopting new and improved standards. iii) While many of your respondents are vegetarian, they can acknowledge that the majority of humans are not. There are good reasons in terms of human health for that. Our role as veterinarians is to ensure that the animals bred for food production are kept in the optimal conditions for their health and productivity. We are passionate about ensuring that these animals are well cared for and that their lot is continually improved. iv) Companies that make animal production uneconomic through strategies that deprive producers of any return, let alone a fair economic return, eg the milk pricing war, will unfortunately impact on animal health and human well-being (in the case of farmers). It needs to be acknowledged that unfettered market competition is not a model that protects animal well-being, nor that of producers, nor ultimately consumers. Marketing gimmicks can have serious implications for all these and the environment. Adjunct Professor Ian Lean and farm industry specialists argue that in a discussion about animal welfare, the realities should be separated from the ideologies. We appreciate Mr Sherman’s enthusiasm for animal well-being. His passion matches our own. Mr Sherman accuses our group of scientists as having a vested interest in agribusiness; yet almost everyone in our community has a vested interest in agribusiness. Agriculture feeds our community. Farmers are in business and must make a living to support their family and provide stewardship to their stock. If, however, Mr Sherman is implying that our vested interest extends to any conflict of interest, that is not correct. The concerned scientists include individuals who lead University Departments and Faculties and acknowledged for their life-long contributions to agriculture and the community. Many are invited Fellows of professional scientific societies, and are among the most highly cited in their fields internationally. Collectively, we greatly exceed 2000 publications in internationally peer-reviewed journals, and texts, including Nature and The Lancet. ii) our desire to present our views in a simple format to minimise information filtering and mis-quotation in public forums. Mr Sherman misrepresents our position on pig housing. We support an orderly move to phase out gestation crates. Our concern is that Coles invoked a more immediate ban, when the Australian pork industry has already taken a voluntary position to phase out sow stalls. In doing this, the pork industry recognized i) the cost of this change and ii) the need to undertake research to ensure that pig welfare can be maintained in new production systems, while also maintaining production efficiency. The phase out is essential to ensure the well-being of pigs, the environment and the farm. Confinement systems were developed to improve the health of sows and piglets. As we re-design sow housing it is imperative that we get it right through appropriate research. We suggest that those who care strongly about animal welfare, consider donating to the strong research groups residing in Australia’s Universities and national scientific laboratories. Mr Sherman attempts to claim a moral ascendancy for his positions through invoking an argument that we must ‘know and feel instinctively’ natural is better. In doing so, he indulges in a ‘naturalistic fallacy’. We refute the ‘naturalistic fallacy’. If we relied on such ‘natural systems’, humans would live to an average of around 35 years, frequently die in child birth, and suffer high rates of infant mortality. Similar gains to those in human health have been achieved for animals through comparable improvements to their environment, health and nutrition. Animal productivity gains made through scientific endeavour are equally impressive. ‘Natural systems’ could not feed the current human population, let alone the ever increasing population. For example, we do not have the land or biosecurity systems to manage the animal welfare and environmental difficulties of large numbers of sows ‘ranging over kilometres’ in any significant population density as suggested by Mr Sherman. We restate our position that in our view the policies of Coles are bad for people, bad for animals and bad for the environment. 2. Beddington J (2011) Foresight: The future of food and farming. UK Office of Science. GROCERY retail giant Coles has unjustly come under fire from a group reportedly led by Ian Lean, adjunct professor of veterinary science at the University of Sydney and managing director of SBScibus, formerly known as Strategic Bovine Services and Cattle Production Consultants. Lean claims Coles’s policy to stock only hormone growth promotant-free beef and to phase out pork sourced from gestation crates is “bad for the environment” and “bad for animals”. His sentiments were echoed in a full-page advertisement in The Australian co-signed by his colleagues, including the chief executive of the Animal Health Alliance, a veterinary pharmaceutical lobby group that includes HGP manufacturers. The ad denounced Coles’s policies as a “threat to the sustainable and ethical production of food”. To those of us without a vested interest in animal agribusiness, this threat appears to be doublespeak for an encouraging movement in the right direction by Coles. There is scientific evidence that HGPs predispose cattle to a dramatic reduction in resting time, and render them more susceptible to climatic extremes, increasing the risk of heat stress. According to the RSPCA the potential side effects of HGPs include infection at the site of the implant injection, aggressiveness, nervousness and rectal prolapse. Notably, HGPs are banned in Europe. But HGP use is just one in a complex web of technologies underpinning the intensification and corporatisation of farming. Many have a more direct and demonstrably adverse impact on animals. 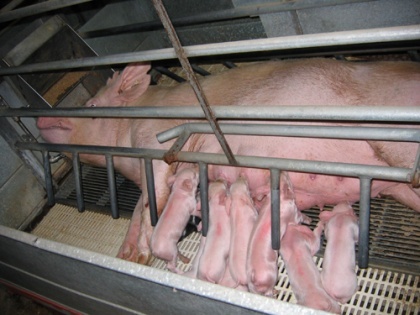 Gestation crates, also known as sow stalls, are metal cages, often with concrete or slatted floors, in which female breeding pigs are individually confined for much of their adult life. These cages are only slightly larger than the pig’s body. Confined sows suffer from poor health including skin ulcerations, reduced muscle mass, bone strength and cardiovascular health, joint damage, urinary infections and gastrointestinal problems. They are unable to exercise any of their natural behaviours. If you kept your dog like this you would be subject to criminal prosecution. Britain banned sow stalls in 1999. The EU has banned them (except for the first four weeks of pregnancy) from 2013 and in the US they have been banned in a number of states. New Zealand and Tasmania have also committed to a ban. Even our pork industry’s peak body announced last year it will phase them out by 2017. The Australian government is still the international laggard. Voiceless is calling on the commonwealth to follow industry’s lead and revise the model code of practice for pigs to ban these cages. Lean and his colleagues deride the “emotion” that motivates those concerned with animals and their wellbeing. But as consumers make animal-friendly choices, they are showing compassion is not so easily disregarded. Coles, and other retailers are making strategic decisions to embrace animal welfare and consumer preferences for responsibly produced animal products. So too, with less fanfare, is Woolworths. It removed cage eggs from its Select brand in 2009, has introduced several free-range deli lines, and is sourcing about 40 per cent of its pork from non-sow stall production systems. The factory farmed animal is coming into view as a sentient being, with complex social and family behaviours, intelligence and a wide range of emotions. Basic decency demands that we take seriously these animals’ needs to be free of suffering and to exercise their rich behavioural repertoires. Lean and his colleagues in animal agribusiness would do well to reflect on this. As Albert Einstein wrote: “our task must be to free ourselves from the prison house” of our personal desires by “widening the circle of compassion to embrace all living creatures”. Brian Sherman is co-founder of animal protection think tank Voiceless Annemarie Jonson is Voiceless’s head of corporate communications. 126 Responses to Professor Ian Lean responds! But I digress so back to that life threatening question of food security. What we must first ask is whether our current food system can feed the world and almost certainly for not much longer. Commonsense must tell us every plausible scenario for feeding the world must include tackling both overpopulation and overconsumption, as well as boosting our ability to grow food. Serious questions do remain about the viability of vegan agriculture—namely how do animal-free farms manage their nutrient cycles without recourse to either artificial fertilizers or animal manures? If we are all going to advocate for farming free of livestock production, then we are arguing for farms that are also free of animal by products like manure. And it is these very by products that form the backbone of most organic soil management techniques at the present time. Yes, it is of course possible to compost biomass and return it to the soil, but this would most likely mean growing crops directly for the purpose of composting them—something that would take land, resources, energy and labour. Boy, you’re quite rude Rick, and ill-informed as well. Fyi, the factory-farming debate is not limited just to Australia and I am free to comment on such issues whether they are Australia-specific or not. The first instruction God gave man was to take charge. If there are occasional abuses fair enough get them sorted. Bush people live with the animal kingdom and they are generally fond of their charges and treat them fairly and well. Thank you for your leadership on behalf of our fellow creatures. I no longer eat meat due to the ethics of meat production. I cannot support an industry that has no regard for a living creatures welfare and emotional needs except as a cash crop. . I understand the farmers are put under pressure to produce more product for less cost because we now have a society that has become the most rampant, wasteful and out of control consumers ever produced in any century…. one only has too look around any street, in any town, on any day to see obese people more the norm than the exception. Clearly this is not only due to meat consumption; its over consumption of everything and no thought about what is going in their mouths. We should treat fellow creatures as we would want to be treated ! My father in law owned a pig that thought it was a dog. It was faithful and loyal, and followed him around like a dog. Even if they are eaten in the end, pigs are intelligent animals that deserve a better life than they one they are being given. We would be horrified if we found a person treating a dog like these pigs are treated. As a commited vegetarian who is currently making the switch to veganism, I am probably reading your column through a biased eye. I am not going to sing the praises of a vegan diet- in fact, I think that human were designed to consume animal products in moderation. I do not argue this. Do I necessarily feel a million times fitter and healthier after erradicating animal products from my diet? No. BUT, I simply cannot, and WILL NOT, forget the horrific images and footage that I have witnessed from these so called “farms”, where animals are treated with such little respect that it is deeply sickening. These images haunt me constantly, and for such reasons, I try my best to be the healthiest vego I can be. People are quick to attack animal activists- and I believe that those who attack are those that are afraid to discover the truth. Some prefer to live in an oblivious and ignorant state and imagine that their milk has been lovingly milked from a cow in a grassy meadow, their bacon magically appearing on their breakfast plate, with no resemblance to the beautiful creature it once was…. and I can understand that! It is easier to turn a blind eye. I think we need to take a long, hard look at the way in which soicety views “meat” animals. Pigs are as intelligent as a 4 year old child. Does your 4 year old child feel fear? Pain? Panic? Well, as does the pig. Look at your pet dog. Would you put the family pet in the level of abuse that “farm” animals are often subject to? Call me a hippy, but I believe that many consumers are becoming increasingly demanging, greedy, and repulsive. Take the new burger at KFC for example- replacing the bun with deep fried chicken? Now tell me, is this really a necessary demand on the meat industry, or simple humans being gluttons? Raegan, I would suggest that FOOD INC is a fictional horror; it certainly doesn’t belong on the documentary shelves. Here is a link to an article prepared by women involved in agriculture that lists many of the myths portrayed in the film. I also will not purchase for my family, any animal product from any retailer without it being labelled hormone-free/free-range and am proud of Coles & Woolworths for supporting this movement. Went to the local video shop the other day & asked for FOOD INC after hearing about it from friends, I see it’s mentioned by your readers here too – (the cover has a large cow on it with a barcode printed across her middle) it’s a doco but probably should be listed in the Horror section! I agree completely Linda. I am also a committed meat eater (despite trying many times to become vegetarian in response to unethical treatment of animals) and I believe there must and should be humane ways to breed animals for food production. This is an emotive issue for everyone involved and of course we should all try to keep a level head and understand the arguements on both sides. But the bottom line for me is that I will never be ok with pigs crammed into crates or chickens crammed into cages or any of these inhumane practices. I think consumers need to be more aware of what goes on in the food industry and at least Coles is drawing attention to the issue and igniting this debate for one thing! Hi Rob welcome back again. Wow, Roma! I visited the farms of Roma during the drought about 16 years ago for a story. My God it was brutal, the huge cracks in the earth. The hardship that came from the lack of rain, the vast distances to be travelled. Very unforgiving land. Can you or your Just Ground people give me some comments on my Animal Land Rights story above? Curious how you guys feel. I don’t know where Esther lives but she makes a lot of sense. We are three hours west of Roma and you are welcome to a reality check here too. You are running a fair debate and our side is putting up factual defense -as was Prof Lean’s letter but the emotive vegan’s and veggies cannot accept death fullstop. “have you been bashing your wife lately?” I speak for the 98% of decent caring primary Producers who work very hard for a pittance and Coles and Woolworths plus the 4 Banks and two Fuel Companies- definitely have no morality or interest in the good of this country. It’s all about predatory pricing , market share and Profit at ANY cost ie If its cheaper , then we’ll import it. Dear Battling Farmer (and certain others), I will not tolerate abusive comments on this site not about me nor anyone else. Firm feisty opinions are fantastic, welcome, enjoyed by all. But personal attacks are unintelligent, and not worthy of this wonderful debate. Your comment has been disallowed. Judy ,the meat is one of the healthiest parts of a Maccas meal in my opinion .It’s all that highly processed bread that was once upon a time, grain and the things they call french fries ,well they were once potatoes. They’re the things that make you fat at maccas let alone the sauces and ice creams and cappuccinos and hash browns etc..
Not disagreeing with you on HGP’s though. I strongly disagree with adding hormones to our meat and the cruel way we treat animals. Sow stalls are disgusting and should be banned, as they are in many parts of the world. I acknowledge that Coles and Woolworths are only climbing on the bandwagon as they sense that the general population’s thinking is heading this way. When will people realise that gorging themselves on meat is causing the problem of under-supply. Meat should be eaten in small quantities and on special occasions, as it used to be in the past. People who eat a small amount of meat and large amounts of grains, fruits and vegetables are far healthier. Take a look at the clientele of McDonalds if you don’t believe me. Anita, animals killed for Australian consumers are given a “quick pain-free death” Why are you trying to imply otherwise? You get a bit carried away with this bit “insensitive maniacs insist on torturing poor helpless animals” Who is torturing animals? It is getting rather tiresome the rent a crowd taking it out on Professor Lean. Are you really trying to imply that he is advocating the deliberate mistreatment of animals? Have you even read what he wrote in the discussion starter above? Ruth I am so grateful for your sensitivity and courage to use your position of journalist to raise and question this area, where others fear to tread evidenced by some of the comments here. I am an animal rights true believer, have been all my life and a review of the laws of the treatment of farm animals is overdue. The conditions are appalling and totally inhumane and I am just so relieved that occasionally I read hope into people like you who are prepared to stimulate debate in the public domain. I am a conservationist and wildlife photographer, – keep up the good work, I love your column. “The greatness of a nation and its moral progress can be judged by the way its animals are treated” Gandhi. I think every human being would prefer a happy, pain-free life and a quick pain-free death. Don’t all animals deserve the same? Why do these insensitive maniacs insist on torturing poor helpless animals as they do? I think Lean should try a crate for a year or so…perhaps his entire lifetime, to experience the pain. Oh, not without less food and more hormones of course! I will not purchase any animal product from any retailer or restaurant without confirmation that it’s hormone-free + free-range – very happy to pay more knowing that I have not supported the inhumane treatment of any animal. Eating vegetarian is a better option to what guys like Lean are dishing up! I find the concepts od “drug free” and “compassionate” mutually exclusive. Do you not want animals treated for illness or injury. Nobody is promoting animal cruelty. Hear a lie often enough and you will believe it. One thing I have learnt in my life is that those acting on behalf of animal welfare or the environment rarely spend their own money whereas farmers who are bearing the brunt of their wild and inaccurate claims usually only get support from themselves and have to use their own time and money. Vets and vetenary academics are probably mostly the same. The organisation “Voiceless” has several corporate sponsors including Lush Handmade Cosmetics (Note to myself-Don’t buy them anymore. Don’t like them supporting unwarranted and inaccurate attacks on farmers and their support groups), Melon Media (can’t boycott them as we can’t afford to pay for spin in the first place-they usually have listed corporates as clients) and pro bono legal services (too bad farmers pay through the nose for theirs). PETA we’ve already dealt with. For PETA to euthanase more than 90% of the animals it is offered is unacceptable. They are also not always truthful to the owners who turned them over to them thinking they would be found good homes otherwise they may have chosen a different shelter. This is just downright deceptive. I do not know how people can be duped into thinking that these organisations have the high moral ground. It may be difficult to find new homes but PETA has many celebrity supporters many of whom could afford to pay for a dedicated nanny for their pet. Let them put their beliefs into practice and give them a good home instead of attacking farmers. Where has the “callous cruelty” of slaughterhouses been documented. I have been in many such establishments and they all go to some lenghts to ensure a quick and pain free death. In Australia, any processing facility which did not do so would have its license revoked. The chickens are not fed hormones. They have been selected for one trait only which is high growth rate. This is because consumers demand “cheap”. HGP treated cattle (which are in the minority) are still active and do not lose the ability to move. I’ve said it before-not wishing to eat HGP treated meat may be a personal choice but it is not an animal welfare issue. These animals are just fine. I am not paid to be a journalist. There is nothing balanced or informed about the majority of this discussion. Most appear not to have even read the posts.